The 4D Mobile Immersive System has been designed to allow you to quickly and simply create immersive experiences in a wide range of settings and locations. With all the technology of a permanent installation, projection, LED lighting, surround sound and bespoke software, neatly housed in this mobile unit, this modular system can develop and grow in tandem with your needs. A robust but easily moveable flightcase forms the core component of our mobile product range. Glide this into any room, dim the lights and create your immersive space anytime or anywhere. BOSE sound system – The soundscapes linked to our content themes set the scene, feed your senses and let your imagination go wild. 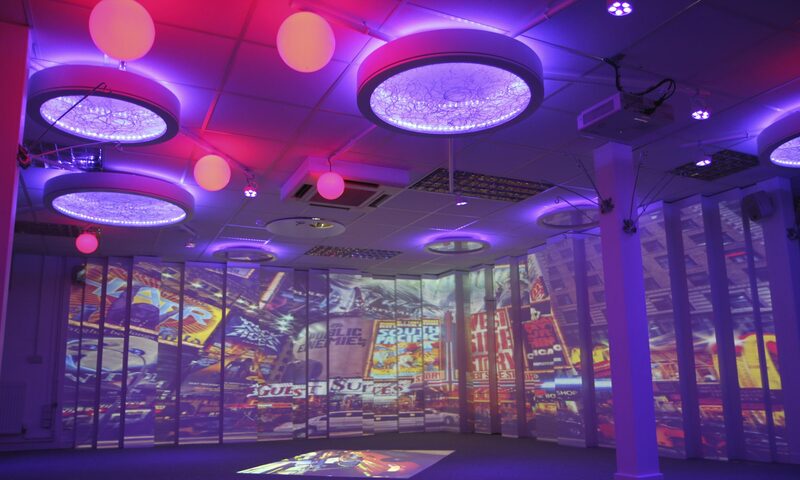 Wireless LED lights –Lighting plays a crucial role in enhancing the mood and atmosphere of your immersive space. Software and Content –Your Mobile Immersive system come preloaded with our “4D create” software and a library of 50 flexible themes. An instant inflatable space – The 5m x 5.5m pod is manufactured from fire retardant ‘rip stop’ material and inflates in just 3 minutes! Projection screens –2 flexible projection screens are included in the package which simply fix to the pop up using clever magnets.